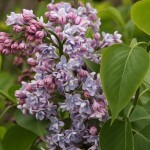 Large shrub with red-violet buds that open into very fragrant lilac blue double flowers. The upright 10" panicles are held above blue-green foliage. Best grown in full sun in a well-drained soil. Cut fresh blossoms for fine, long lasting flower arrangements. Prune after flowering to promote future blossoms.